Mark Fox transforms his paintings and drawings into sculpture. The artist hand-corrugates his private drawings—some drawn from transcriptions of Catholic Doctrine—producing sheets of handmade "cardboard." He then cuts this material into sections and assembles sculptures that simultaneously invite reflection and deny access. Nathalie Miebach creates drawings in the form of musical scores from data generated by weather events. These in turn inform colorful sculptures the artist weaves from wood, reed and yarn. Miebach prizes weaving for providing a grid to translate phenomena that occur in three dimensions and offering new ways of picturing data. John Newman makes drawings before, during and after his sculptures, many of them as ways to understand how to realize new ideas. 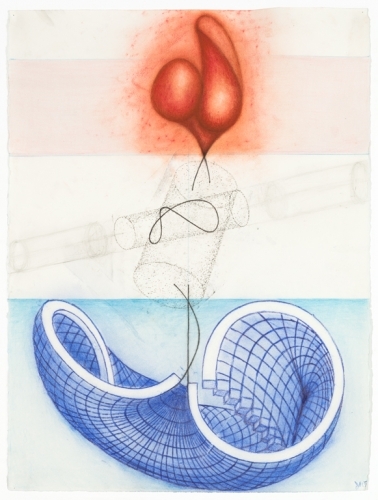 Noted for his eccentric combinations of natural, manufactured, computer-generated and hand-crafted elements in his modestly-scaled sculptures, Newman likewise uses a variety of materials and techniques in his works on paper. Judy Pfaff, who will also construct an installation in the museum galleries, is a recognized pioneer of installation art. Aptly described as “a collagist in space,” Pfaff embraces a variety of materials and readily marries two- and three-dimensional elements in work distinguished by its dynamism and complexity. Works by each of these artists will be on display in dedicated gallery spaces, allowing for understanding of their processes and the diversity of ways they work across media. Intersections: Artists Master Line and Space is organized by the Akron Art Museum and generously supported in part by the Lehner Family Foundation, National Endowment for the Arts, the Elizabeth Firestone Graham Foundation and the Ohio Arts Council. Special thanks to Hilton Garden Inn – Akron.